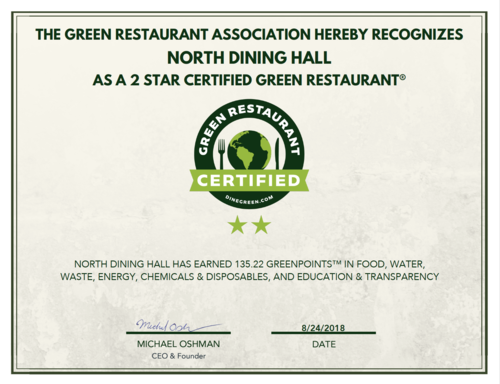 The Green Restaurant Association recently awarded North Dining Hall 2 Star Certified Green Restaurant status. This honor is based on 40 criteria ranging from the amount of vegan and vegetarian dishes served to the efficiency of appliances to recycling practices. The 2017 renovation allowed North Dining Hall the opportunity to improve their sustainability practices through the installation of items such as digital menu boards, energy star appliances, occupancy sensors, and efficient faucet aerators. Behind the scenes, staff use paper products made from 30 percent post-consumer waste and participate in the University’s recycling program. Guests use only reusable dishes, silverware and glasses and enjoy a menu that boasts 23 percent vegetarian main dishes. Water bottle filling stations offer added convenience and reduce the use of plastic. 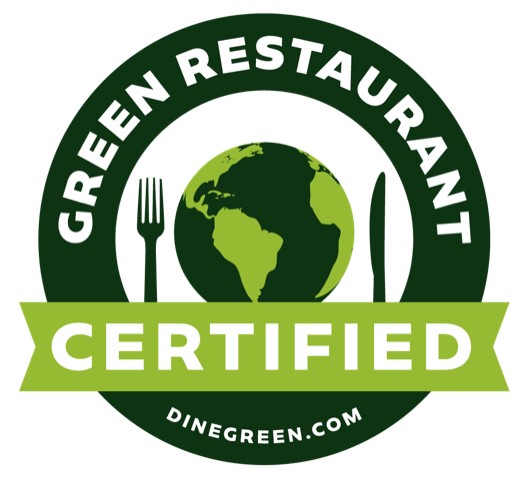 A full list of certification criteria and points awarded can be found on the Green Restaurant Associations North Dining Hall page. Originally published by Molly Moran at dining.nd.edu on January 21, 2019.